In our “Worth a Thousand Words” series, the Fotoskribe team sets out to show how simple blogging can be by taking a single picture and blogging the story behind it. This series is meant to show how details, memories, and moments are the most important thing to capture when you blog about your photography. Every one of your images captures a story. Those stories are worth sharing. When thinking about what story you should tell on your blog, sometimes it can be overwhelming to remember every single detail of every single moment. In this series, we want to share how the stories you tell might just be centered around one key moment. A picture is worth a thousand words. Put those words on your blog. Whether it’s a story of an experience you had as a photographer, a story of what your customers experienced or a story of how you were inspired to create the image, sometimes one story is enough for a whole blog. This image comes from one of our writers, Shelby Law, and she tells her story here. My husband and I were married in Utah with a reception at his family’s house in their gorgeous backyard. However, my entire family is from the South. Not all of them could come all the way out to Utah for the wedding. So, we had a second reception in Georgia to include everyone. We staged a family photo shoot about a week after the wedding. That way, we could update all the family pictures to include my husband. By that time, my sister and I both were out in Utah for college, leaving our youngest sister behind at home. Emily, the youngest, is eleven years younger than me. She had been very young when I left home and not that much older when our sister, Bethany, left. But that didn’t mean the bond that we shared wasn’t one of the strongest things we had. I called home all the time and was able to talk with Emily. (And Bethany, before she came out to join me at college). As any much-older sister will tell you, that “big sister” drive doesn’t change at all: no matter how much distance you put between you. In fact, our bond was that much stronger when the three of us came together for my wedding, celebrating and laughing together for two weeks of joy. This particular picture was taken during the family photo shoot that we staged after the reception. Everyone wore white shirts and jeans so we looked unified as a family. We headed out to the gardens around the neighborhood office for our portraits. While there are plenty of pictures from that day of us swinging on the swing set and posing as a full family, this picture is my favorite. We didn’t even know our photographer was taking it! At the moment this image was captured, I was talking to my baby sister about something-or-other and made a joke. Whatever I had said prompted the laughter you can see here. But what you can probably also see is that it was a genuine moment, the kind of thing that used to happen all the time growing up. 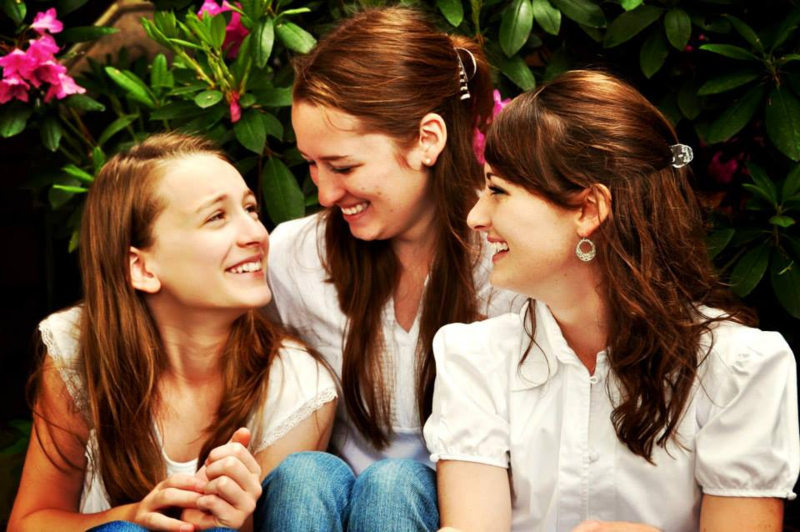 We three sisters can’t stop giggling and teasing each other and being goofballs when we get together—all because we absolutely love each other. When we got our pictures back and saw this one, all three of us agreed that it was our favorite. I constantly go back to it whenever I want to show an image of what my sisters mean to me. Even though we’re all much older and look a little different, that laughter and love is still the same. That, more than our haircuts and our nice white shirts, is what was captured here. Here at Fotoskribe, we are committed to helping you blog regularly and consistently. For more ideas on what to write on your blog, take a look at this article: “What am I Supposed to Write About?” And, of course, you can always contact us for more information on how to get started.